New Zealand’s Team Mobile Eye is one step closer to winning the worldwide Microsoft Imagine Cup, with the Mobile Eye app, which helps the blind, beating teams from 69 other countries to secure a place in the top six. This is the third year in a row where a New Zealand team has made it to the finals of the technology competition, which are currently taking place in Sydney. While judges are not officially allowed to give comments on contestants, one told Computerworld the viability of the business model and the almost complete product is impressive. “I think they are in a very strong position,” says the judge. Today AUT maths and engineering student Aakash Polra, AUT design student Jade Tan, and University of Auckland software engineering student In-Hwan Kim (see photo below) will make one final presentation at Sydney’s Convention Centre. The result of this presentation will directly impact their likelihood of winning the competition tomorrow. The Imagine Cup imvolves university students from over 75 countries competing by developing and pitching technology solutions to world problems. Mobile Eye’s entry into the software design category is a system which helps blind people identify objects or their surroundings using a mobile phone (currently Windows Phone 7 devices, but other smartphones and some feature phones are supported). Through an app installed on the device, a photo is analysed to detect colour, the level of darkness, or character recognition in order to identify it. Once an answer has been found it is read to the user through the speakers on the phone. More complex answers requiring context can be crowd-sourced by tapping into the user’s Facebook friends, or third-party services. Mobile Eye says it expects to charge users $5 a month for the service, a figure it reached after conducting surveys on 20 members of the Royal New Zealand Foundation for the Blind, who are also beta testers for the product. 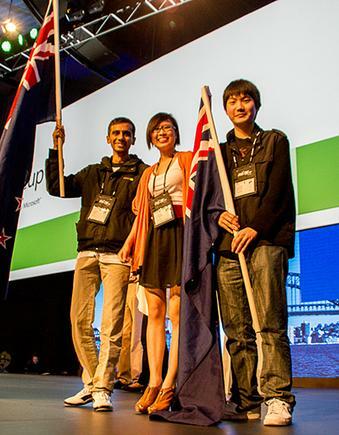 Earlier this year Mobile Eye beat out 15 other New Zealand teams, winning the chance for the team to compete at the Imagine Cup finals in Sydney. Computerworld will announce the winner of Imagine Cup tomorrow, with more information on the team’s solution in the next edition of Computerworld magazine.